Allie McMurphy is busy making yummy fudge for the summer holiday–until murder gives her something else to chew on. . .
It’s not Fourth of July on Mackinac Island without fireworks and fudge. The Historic McMurphy Hotel and Fudge Shop is supplying the treats–and Allie has hired Rodney Rivers, the biggest name in aerial displays, to create an unforgettable spectacle. Unfortunately, Allie finds him dead, covered with screaming chicken fireworks, just before the entire warehouse of pyrotechnics goes up in smoke. Is it arson or is it murder? 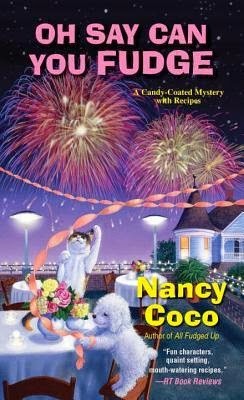 Allie and her bichonpoo, Mal, must sift through the suspects until the killer is caught and the island can enjoy a star-spangled celebration. Any mystery involving picturesque Mackinac Island, homemade fudge, and a cute little dog is sure to be fun ... and Oh Say Can You Fudge exceeded my expectations. I have not read the other books in this series, but this mystery worked fine as a standalone. 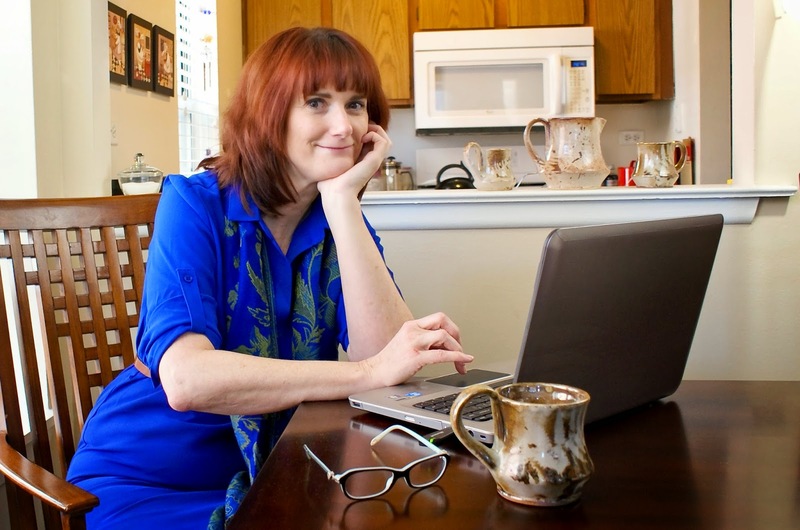 It is a fun read, with a likeable protagonist and a charming setting. The book is well written, with an interesting plot and surprises and twists in the mystery. 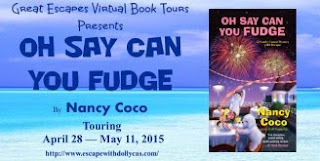 I will add that I loved the details of candy making in the book ... it made me crave fudge! 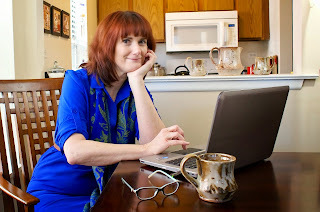 I love cozy mysteries, and really enjoyed this read. I would highly recommend Oh Say Can You Fudge to other fans of the cozy genre. It would be a great summer beach read! Most recently Nancy has three cozy mystery book series going. Then there is Engaged in Murder- the first in the Perfect Proposal series from Berkley Prime Crime. All Fudged Up was Nancy’s first National Best seller. I received a copy of this book from Great Escapes Book Tours in exchange for an honest review. It's been fun following the tour. Congratulations, Nancy! Congratulations! Sounds like a great book.